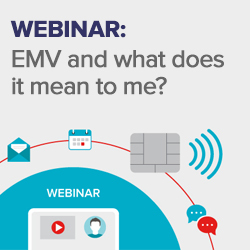 WEBINAR: EMV AND WHAT DOES IT MEAN TO ME? EMV and what does it mean to me? An informative webinar originally recorded on February 23, 2014. In association with the Electronic Transaction Association (ETA), Cayan invites you to attend “EMV and what it means to me” presented by industry thought leader, and subject matter expert ETA CEO, Jason Oxman. This link will take you to the Cayan website where you can register and view the webinar recording.